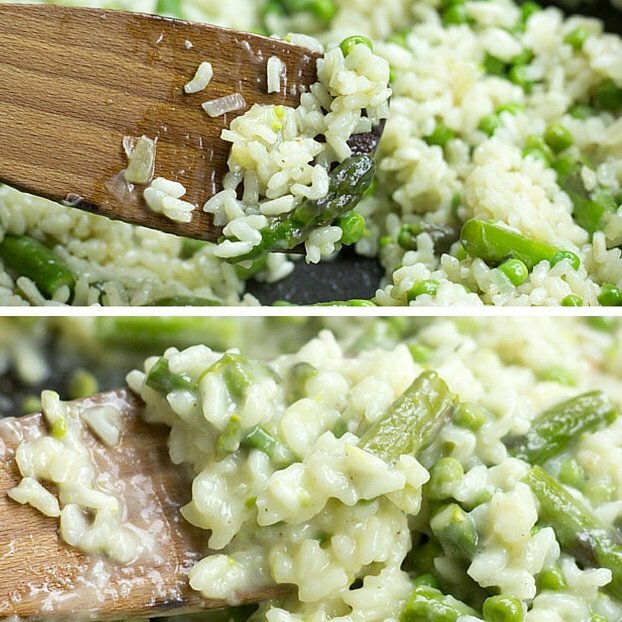 Creamy Asparagus Risotto - Awaken the Italian in You! 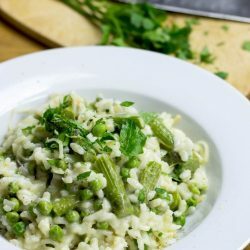 Creamy Asparagus Risotto: quick to make, really satisfying and actually healthy, when not drenched in butter and cheese. Unfortunately there is a drawback to risottos: basically, you’re not allowed to get it right unless you have an Italian grandma, and this is why I expect someone commenting that this version is an insult to all Italians every couple of hours. But I’m prepared. I did my tests and the necessary research to make this asparagus risotto not only tasty, but also to stand up to the criticism of Italian know-it-alls. Alright, here are the key questions that apparently make or break a risotto. To fry or not to fry the rice? 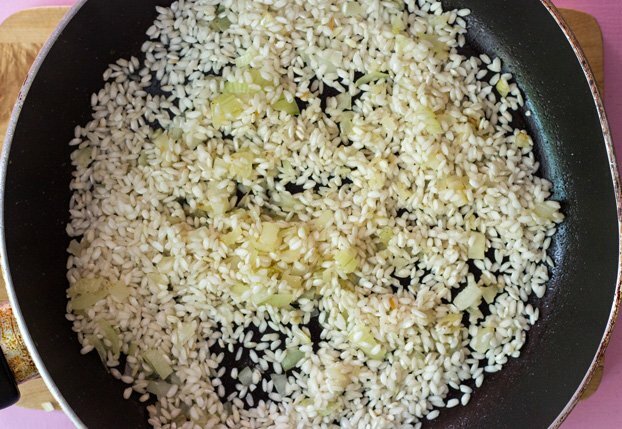 In many recipes it is emphasized that the risotto rice should be fried for about two minutes. 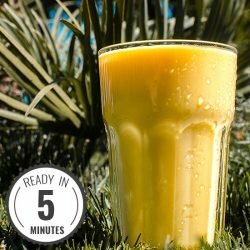 Kenji Lopez from The Food Lab made the test. His findings: the longer you fry the rice the nuttier its taste gets. But also: the longer you fry it the more the rice loses its creaminess. To ladle or not to ladle the broth one bit at a time? Many Italians will recall that their grandmothers used to add broth to the rice one ladle at a time, waiting until it was absorbed before adding the next ladle. Apparently there is a theory behind it: Danielle Walsh from bon appetit believes by slowly adding broth, you allow the rice to bump up against each other, which creates that creaminess. On the other hand, in his test Kenji Lopez didn’t notice a difference when all the broth was dumped in right away. The only drawback: you might add too much broth and make the risotto mushy. Personally, for laziness reasons I’m on Lopez’ side. Top: needs more broth; bottom: ahh, that looks much better! To throw or not to throw in the veggies? Some folks advise against adding veggies to the risotto while it’s cooking in the pan, like Danielle Walsh from bon appetit. Their reasoning is the veggies will get mushy. And that is bad, agreed. 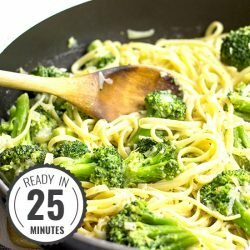 But why not throw in the veggies according to their cooking times? For example, the asparagus goes in 5 minutes before the rice is ready. Gennaro Contaldo, obviously an Italian chef, does the same (see the video below). So, I see no problem there. By the way: it’s fun to watch the entire video on how he makes risotto. Italian passion right there. 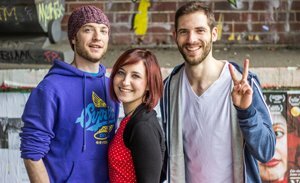 Awaken the Italian in You! 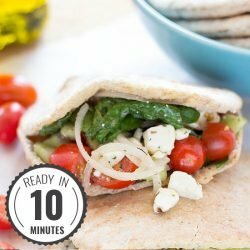 Quick to make, so satisfying and tasty to eat. 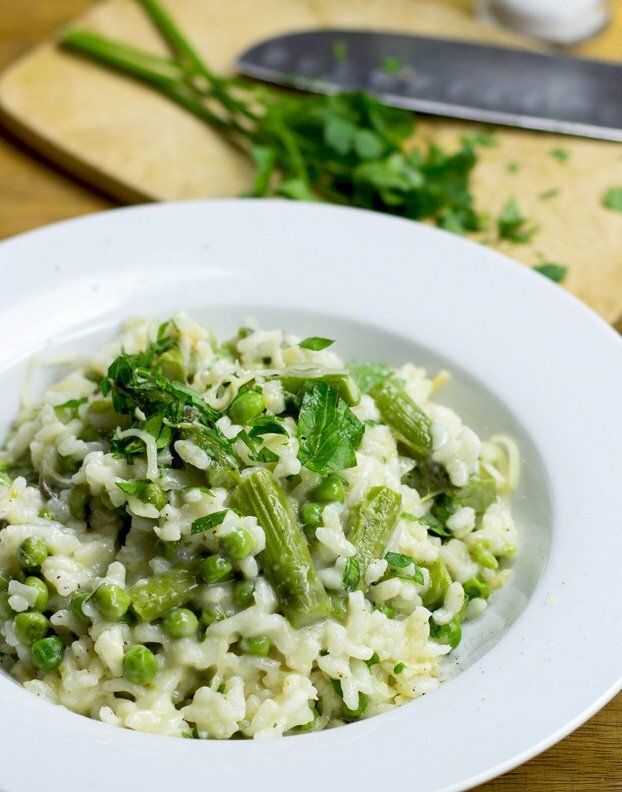 We’ve also included the key surprisingly easy tips to getting the perfect risotto. Optional - if you have them to hand, great - throw them in! 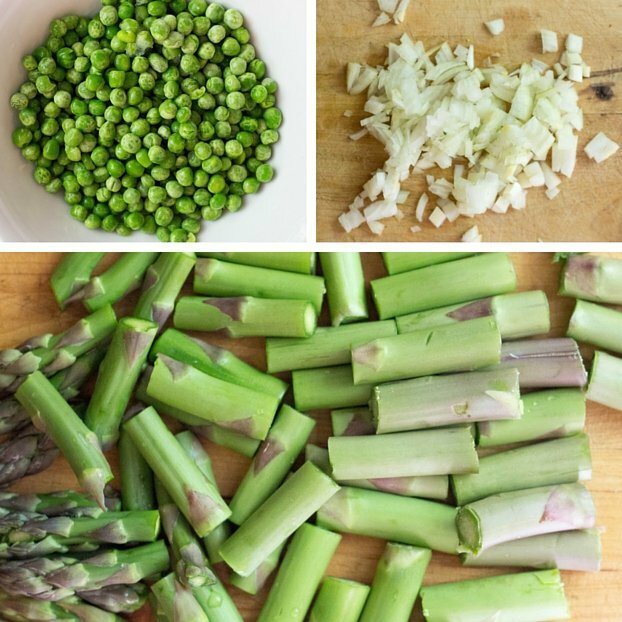 Chop the asparagus into small pieces. Let the butter/oil melt in the pan and add the onion and cook until it’s translucent. Then add 500ml of the stock and stir. Add in the asparagus and peas, stir and leave for 5 more minutes. You probably need to add some more liquid (it will depend on the heat applied). Now, check the rice. It may need a few more minutes to finish cooking. Once the rice is soft it’s time to give it the finishing touch - if needed add a little water (add in small amounts, you don’t wanna overdo it!) and a little grated cheese to get the creaminess right. Remember: it needs to flow like lava. IF YOU LIKED THIS RECIPE: Then you need to check out this more oriental style rice dish known as Pea Pulao. Also, if you haven’t yet then make sure you try this African Peanut Soup! We were surprised by the amount of great feedback we got back on that one, and we love it too! Please note the nutritional information does not include 'optional' ingredients. I love risotto! Such a comforting dish! Comforting is the right word for this one 🙂 Love that creamy texture! I make risottos all the time, they’re so comforting and easy to throw together! This one sounds perfect for spring! the italian grandma bit is a FARCE! My grandma was the most Chinese grandma ever, and i make amazing risotto (if I do say so myself;) ). usually i got for butternut squash or mushroom, but i LOVE this asparagus version. Mmm i bet this tastes amazing with the creaminess of the risotto. Man I love risotto! It sounds absolutely delicious with all those flavors. Mint is one of my favorites! It rocks indeed Sophia! Especially at this time of year, for me there’s something awesome about pea, mint and asparagus. Love it! Don’t you just love asparagus season? I love this risotto idea but will have to find substitutes for the cheese and butter because I’m dairy intolerant. I’m thinking nutritional yeast! My husband made once squash risotto, that was huge hit. Now i will give this recipe to him 🙂 These looks so delicious. Awesome Uma! Please let us know how you like it! this screams spring all the way! Thanks G! Really glad to hear that 🙂 that’s very interesting to know about cheese not being used to add creaminess – and you mean you use nut butter at the beginning? I bet that’s delicious! I don’t care if somebody is Italian or not, this looks delicious! I really hate stupid rules…if food is good, it’s good, period. 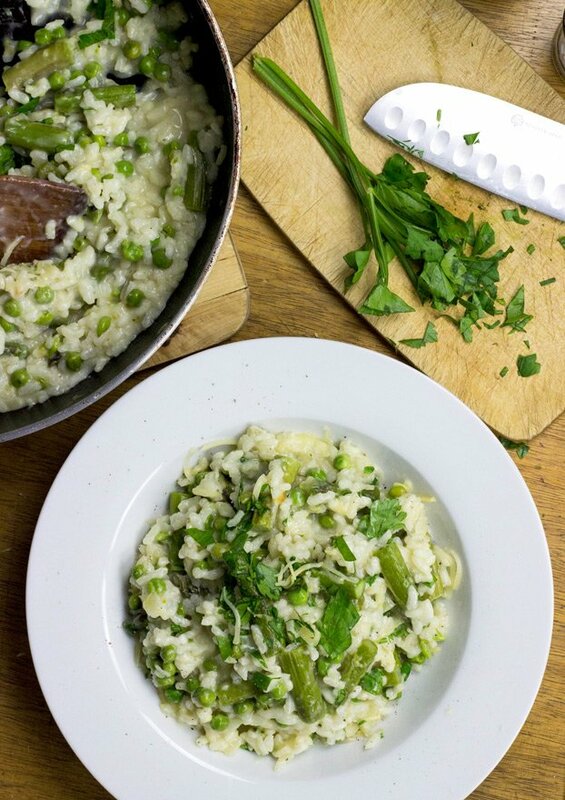 My favorite risotto I’ve ever had was in Ireland and it was a pea and asparagus risotto…and it was mind-blowing. I could live on it! 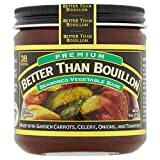 I’m just like you, I add peas or veggies (depending on which kind) right before the end of the dish according to how long they would take to cook. Who cares about rules, if the end result is delicious, nobody will care! What a fab looking risotto! I love risotto so much but actually never used aparagus. I’m so gonna make this soon. Loved this recipe Dave. Interested that you don’t include white wine (the step between frying the rice in the oil and the stock). I included it because that’s what I always do with risotto. I also added both parsley and mint and it was delish!